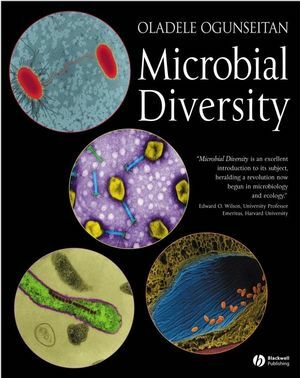 This book offers the first comprehensive, in-depth treatment of microbial diversity for undergraduate and graduate students. Using a global approach, Microbial Diversity illustrates the impact of microorganisms on ecological and Earth system phenomena. Uses key ecological and global phenomena to show the continuity of microbial contribution. Illustrates the importance of microbial diversity for the understanding of global physiochemical and biological processes. Presents analyses of microscopic, culture, molecular, and phylogenetic systematic methods. Shows the relevance of microbial diversity to global environmental problems, such as climate change and ozone depletion. Features numerous illustrations, including over 60 4-color photographs of microbes. Oladele Ogunseitan is professor of Environmental Health, Science, and Policy at the University of California, Irvine. He has been a Global Environmental Assessment Fellow at Harvard University, and a Macy Foundation Fellow at the Marine Biological Laboratory in Woods Hole, Massachusetts. Part I: Concepts and Methods. 1. The Concept of Microbial Species. 2. Microscopic Methods for Assessing Microbial Diversity. 4. Molecular and Genomic Methods. Part II: Principles and Applications. 7. Biogeochemical Cycling of Carbon and Nitrogen. 8. Biogeochemical Cycling of Phosphorus, Sulfur, Metals, and Trace Elements. 9. Cross-species Interactions Among Prokaryotes. 10. Interactions Between Prokaryotes and Eukaryotes. 11. Microbial Diversity and Global Environmental Issues. Microbial Diversity is an excellent work, dealing well with a paradox that is well known within microbial ecology: we are aware of how much we don't know. The real strength of Ogunseitan's book is that it accounts brilliantly for what we do know. The book reviews diverse fields, from bioinformatics to environmental engineering, and each is dealt with thoroughly and accurately. Few books are available that highlight the importance of microbes in every aspect of global processes; this book is definitely one of them. The text will be ideally suited to both under- and post-graduate students studying microbiology. "Microbial Diversity is an excellent introduction to its subject, heralding a revolution now begun in microbiology and ecology."